A challenging phase in the selling process comes after all the hard work is done in generating leads and qualifying them. In order to effectively present to the targeted decision maker, contact needs to be made with the prospect in order for the appointment to take place. Without this, presenting our products or solutions to the customer in any other way will not be effective at all. Here lies the challenge: how do we make contact with the prospect whom we may not have met before, in order for us to gain that all important first appointment? And with the way most organizations are set up nowadays, how do we cut the red tape and overcome gatekeepers long the way? How do we land that important appointment that we need? This intensive, hands-on, activity-driven program teaches skills that boost sales and profitability through increased understanding and effective implementation of the selling process. 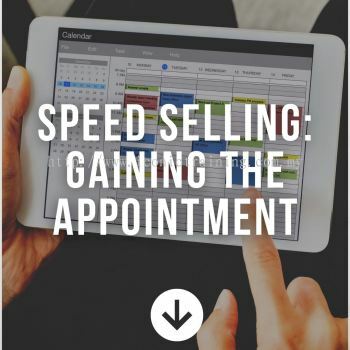 It helps sharpen the selling skills of even experienced sales personnel, empowering you to take advantage of every sales opportunity and aggressively expand your business professionally. By providing youu with a rigorous training environment, your active participation in our program will enable you to apply and sustain your learning to a point of forming winning habits. You will have the ability to create the greatest positive impact at every given opportunity when making first contact with your prospects every time.